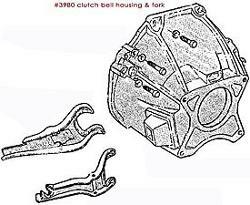 Good Used Clutch Bellhousing & Fork for 66-77 Classic Ford Broncos with 289, 302 or 351W V8 Engine. If you do not specify whether you need tab style or wire bail style we will send you the best available. Either will work with any 289, 302 or 351W Bronco.